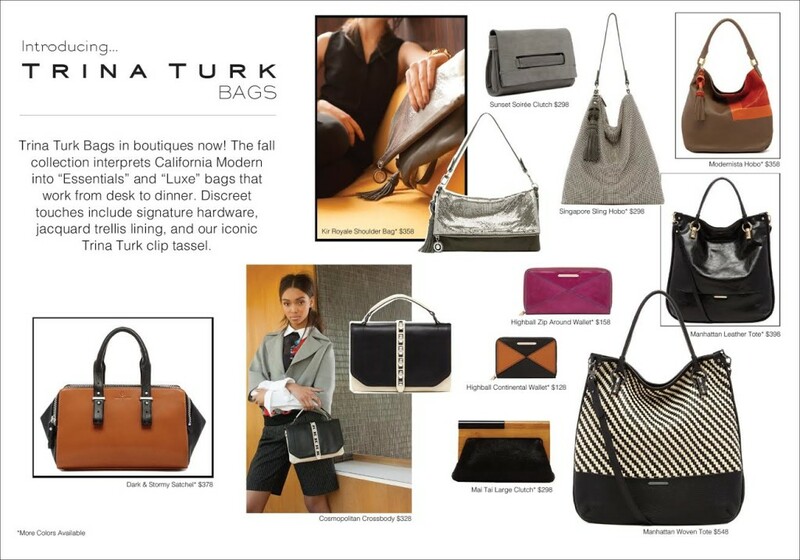 The collection interprets California Modern into “Essentials” and “Luxe” bags that work from desk to dinner. “Essentials” are modern totes, satchels and cross body silhouettes in soft Nappa and supple pebbled leather, along with shiny goat and haircalf. The chic simplicity of texture mixes and neutral toned color blocking works with any look. “Luxe” are day-to-evening bags and clutches in metal mesh, soft leathers and vivid haircalf with accents of wood, resin and metal. Discrete touches include signature hardware, jacquard trellis lining, and our iconic Trina Turk clip tassel.